Integration: Scheduling jobs on different machines? 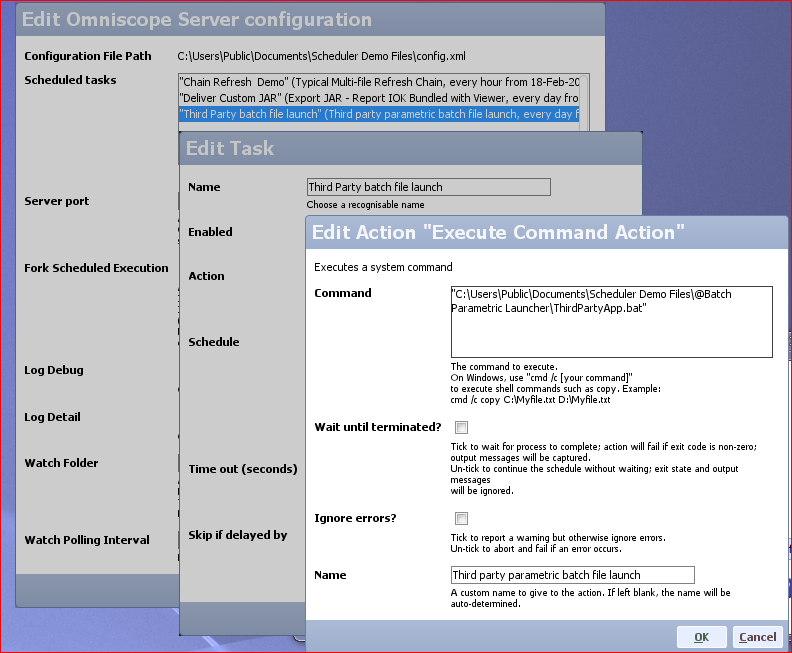 Is it possible for Scheduler to launch a job on another PC on the network, so that the job runs using the copy of Omniscope on that second machine? Steve - If both machines are Server licenses or above, then the same Task List can be shared across machines, such that Task Lists can edited in one machine while executing on the other. The file paths defined for each Task will determine what file is acted upon on which machine. This part of your answer inspired us. "If the remote machine is a Desktop with IOK files stored on it, then you can use an (optionally parametric) batch file in the Task List to launch the file from the remote Desktop machine..."
I read the other topic as well. But how do I trigger our server to open a file on my local pc? How you can explain your answer so we can implement this great functionality. REM Absolute path to the template file being launched. set omniscopeTemplateFilePath="C:\Users\Public\Documents\Scheduler Demo Files\@Batch Parametric Launcher\ParametricLaunchFile.iok"
REM List of parameters being used to fully define data sources and launch settings for template file. REM Launching the template file with the parameters list defined above. Thank you for your clear explenation. Maybe I am missing something. But our server is not connected to my local machine, so the path that you suggest does not exist. 2 In that command I give the path of on IOK file on my local machine. 3 When execting, the file should open on my local machine. Maybe it is easier to have a skype call about this situation. The method Thomas suggested only works if you want to run a copy of Omniscope on the server machine. Both of these options are fairly complex, and you would probably need the help of your network administrator to set them up. One you have established one of these methods and you are capable of remotely executing programs on your windows network, you can use a .bat file to automate the process as explained by Thomas in the previous posts.